One hundred and fourteen years ago today, my 3rd great grandparents Mathias and Christina Porubsky, their son Carl and five of his siblings were on an adventure at sea. The Porubsky’s had left their Volga German community in Kamenka, Russia, perhaps to escape the Tsar and policies of assimilation and were en route to Topeka, Kansas. It was there that an enclave of Volga Germans had established themselves. They had set out aboard the SS Roland of Norddeutscher (North German) Lloyd. At 345 feet, the Roland was just a few dozen feet longer than today’s Staten Island Ferry. They sailed from Breman, Germany and were en route to Baltimore, Maryland. The Porubsky family was among up to 800 people stuffed below deck in 3rd class. On June 22, 1900, they arrived at the passenger terminal along the Patapsco River and proceeded overland to Kansas. This manifest marks their journey to a new life in America. At the time of his arrival, Mathias Porubsky was a 44-year old laborer; his wife Christina was 38. An uncle had paid their way, although the identity and relationship of this uncle remains unknown. They arrived with $20 in their pockets (about $550 in today’s dollars). Checkmarks indicate that all but the youngest two could read and write. Finding the above images was not without it’s small challenges. Both Ancestry.com and FamilySearch.org have the manifest in their record collections but neither is perfect. The two sites, which are the largest genealogical record holders in the world, only sporadically overlap so it’s not always the case that both sites will have the same record. I retrieved the Ancestry.com manifest because it appeared as a ‘hint’ on Mathias Porubsky’s page. Ancestry.com hints allow users to quickly identify records that may be related to their ancestor and attach them to their family tree. Unfortunately, many people accept every single hint without closely examining the record to ensure it belongs to their ancestor. 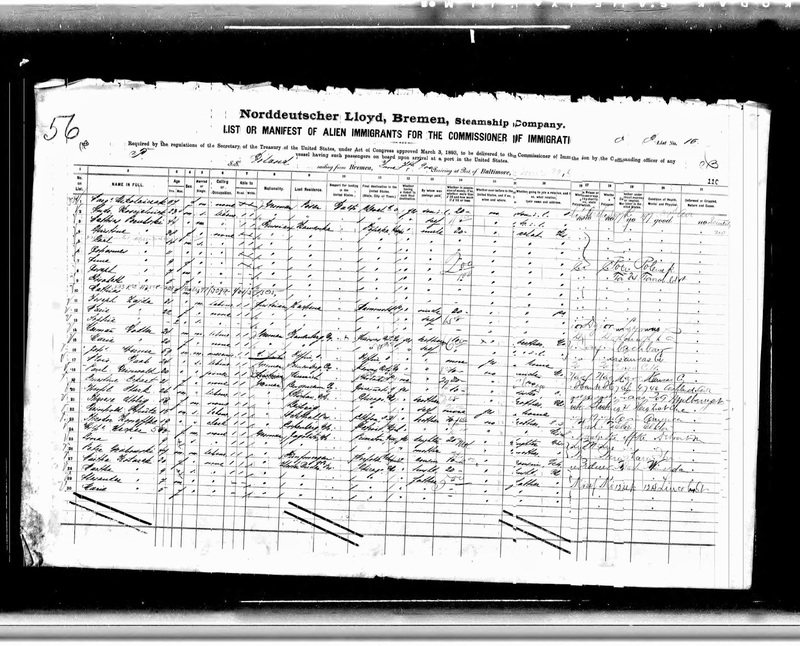 The Ancestry.com record was poorly scanned, as it is crooked and has several columns (18 and 19) chopped up. That said, the index (transcription) of the manifest was spot-on and I was to quickly find my ancestors on the page. The FamilySearch.org document is a very clean scan, but slightly darker. Unfortunately, a very poor transcription for this document made it much harder to locate. The ship was listed as the SS Poland, instead of the SS Roland. I couldn’t even begin to tell you how the family name was listed because numerous searches failed to turn up anything. Having already located the Ancestry.com version of the manifest, I used my search skills knowledge to search for a simpler surname I knew was further down the same page. Sure enough, after I located ship mate Joseph Zadja, I scrolled up to find the Porubsky family. Having these types of documents tells a lot about the travel conditions my ancestors endured to arrive at a new life. When paired with other documents, we can start to piece together a life story, which is the ultimate goal for any genealogist. 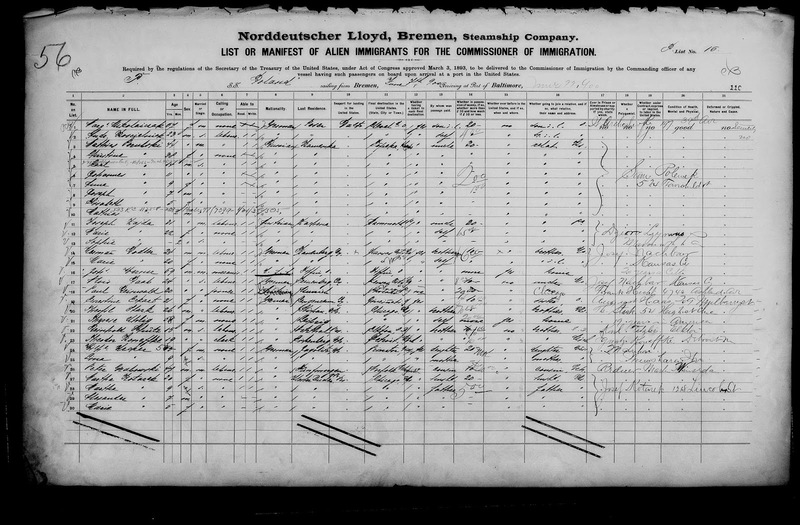 “Maryland, Baltimore Passenger Lists, 1820-1948,” index and images, FamilySearch (https://familysearch.org/pal:/MM9.3.1/TH-1942-29149-8032-62?cc=2018318 : accessed 18 Jun 2014), 1891-1948 (NARA T844) > 19 – Jun 7, 1900-Feb 25, 1901 > image 180 of 876; citing NARA microfilm publications M255, M596 and T844.